Gear Pump | THERMO Spoken Here! The gear pump of a running engine receives oil at atmospheric pressure from the oil pan. Power from the engine passes through a belt-driven pulley to the shaft of the pump's "driver gear." As the driver gear rotates, it forces the "driven gear" to rotate. 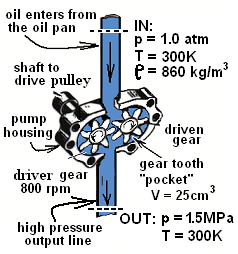 Supply oil fills the spaces or "pockets" between the teeth of both gears. As the gears turn these "pockets" of oil are forced around the outer perimeter of the pump housing to exit at high pressure. Use the information of the figure. Estimate the ideal, steady mass rate of the pump? ♦ At any instant, the amount of oil entering and leaving is the same. And also oil is incompressible hence mass cannot accumulate within the rigid boundary of the pump housing. The mass equation will tell us simply "what mass enters leaves." What least, ideal, steady power does the pump consume? ♦ The energy equation will have some terms that are zero. We write the general form of the equation, then strike the inapplicable terms. Internal energy of a liquid is a function its temperature and specific volume: u = u (T , v). It is assumed that vout equals vin. Also the temperature increase with compression is small. Resulting is uin - uout ~ 0. We assume frictionless operation. Temperatures will remain what they were initially and the sum of heats will equal zero. We express the pressure difference, pin - pout, as - Δp. Inspecting our result, we expect both W-dotshaft and [pout - pin] to be positive. So the signs of Eqn 6 are consistent. Below we check the terms for dimensional consistency. Now apply the numbers to obtain the pump power requirement. We included the shaft of the drive gear as system to focus our equation. The task of that shaft is simply to convey work (from its belt drive to its gear and) to the oil. Were that shaft's bearings frozen or were gear teeth pitted and scared from trash that passed through, power to that shaft would arrive to the oil partly as work to pump and the rest as friction - to do nothing but stir things into a mess. The work rate of friction is assigned a negative sign in conformity with our sign conventions for work and heat. The negative sign means friction manifests itself in its system as a rate of energy loss. It is not that the system loses energy. It is that the system loses the ability to do work. Friction turns mechanical energy into thermal energy. The energy is still there, in thermal form. To make use of that thermal energy requires that it be put through a thermal engine. Phew! More tools and methods are needed to extend thermodynamics to solutions of frictional effects of the energy.